His Noted Guests Learn from the Red Man to Use Fingers Instead of Forks. LONDON, Aug. 9.—A feast was given here to-day which afforded a novel sight to the astonished Britishers. A long table was stretched under a big tent on the grounds where Buffalo Bill is giving his Wild West show. The table was surrounded by a distinguished party. In the middle sat the veteran Simon Cameron,  with his keen eye fixed on the huge pieces of ox ribs which were hanging on three sticks over a large fire which had been built on the ground. A young Indian squaw, clad in a bright red dress, occasionally raised her daintily moccasined foot and gave the ribs a kick to keep them swinging back and forth in the flames. Hon. Chauncey M. Depew  sat beside Mr. Cameron and also watched the ribs and the comely squaw; and so did Lawrence Jerome,  Senator Hawley of Connecticut,  Editor Murat Halstead  of Cincinnati, Justin McCarthy,  the Parnellite member of Parliament and author, and 40 other gentlemen, nearly all of whom are celebrated personages. Each guest was engaged in the same occupation, and divided his attention about equally between the roasting bovine and the dusky aborigine. Mr. Buffalo Bill Cody, in all the gorgeousness of his alleged frontier attire, was the host. The guests, or at least the Britons among them, had come to see what a real American rib roast was like. The ground before the table was covered with an abundance of fresh straw through which 50 sharp-pointed stakes were sticking up. While the guests were watching the fire and the ribs and the maiden, a band of gaudily-painted Indians appeared on the scene, and squatted down upon the straw, one by the side of each stake. 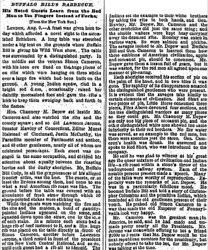 In a minute each stake had a huge rib of beef fastened to it, and a like huge rib was placed on the table directly in front of Simon Cameron, another before Lawrence Jerome, a third rested in front of the president of the New York Central Railroad,  and so on, until each guest had a rib all to himself. 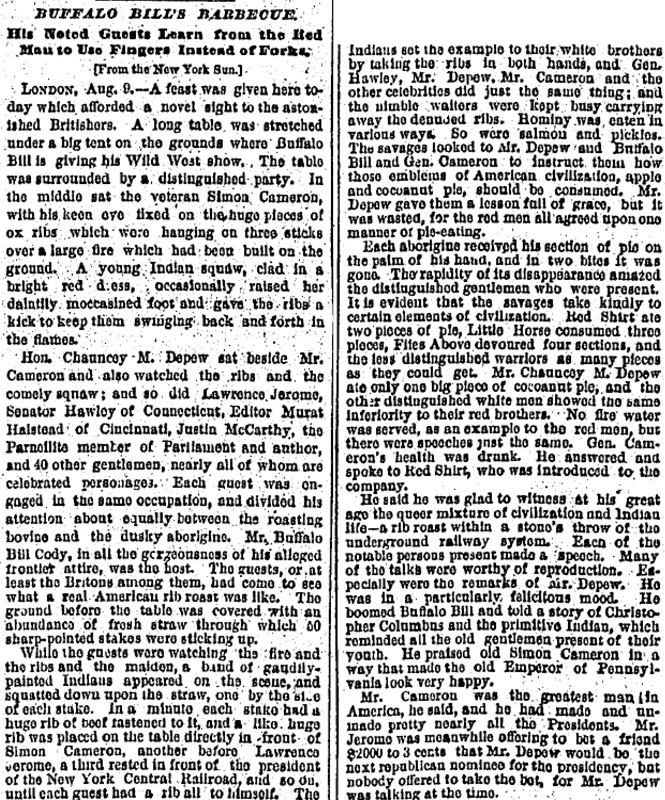 The Indians set the example to their white brother by taking the ribs in both hands, and Gen. Hawley, Mr. Depew, Mr. Cameron and the other celebrities did just the same thing; and the nimble waiters were kept busy carrying away the denuded ribs. Hominy was eaten in various ways. So were salmon and pickles. The savages looked to Mr. Depew and Buffalo Bill and Gen. Cameron to instruct them how those emblems of American civilization, apple and coconut pie, should be consumed. Mr. Depew gave them a lesson full of grace, but it was wasted, for the red men all agreed upon one manner of pie-eating. Each aborigine received his section of pie on the palm of his hand, and in two bites it was gone. The rapidity of its disappearance amazed the distinguished gentlemen who were present. It is evident the the savages take kindly to certain elements of civilization. Red Shirt ate two pieces of pie, Little Horse  consumed three pieces, Flies Above  devoured four sections, and the less distinguished warriors as many pieces as they could get. Mr. Chauncey M. Depew ate only one big piece of cocoanut pie, and the other distinguished white men showed the same inferiority to their red brothers. No fire water was served, as an example to the red men, but there were speeches just the same. Gen. Cameron's health was drunk. He answered and spoke to Red Shirt, who was introduced to the company. He said he was glad to witness at his great age the queer mixture of civilization and Indian life—a rib roast within a stone's throw of the underground railway system. Each of the notable persons present made a speech. Many of the talks were worthy of reproduction. Especially were the remarks of Mr. Depew. He was in a particularly felicitous mood. He boomed Buffalo Bill and told a story of Christopher Columbus and the primitive Indian, which reminded all the old gentlemen present of their youth. He praised old Simon Cameron in a way that made the old Emperor of Pennsylvania look very happy. Mr. Cameron was the greatest man in America, he said, and he had made and unmade pretty nearly all the Presidents. 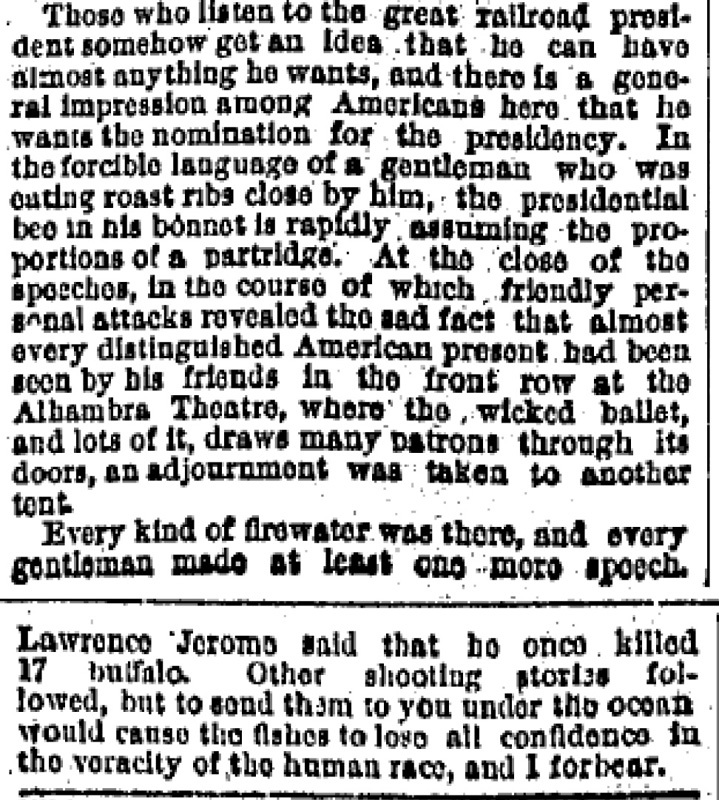 Mr. Jerome was meanwhile offering to bet a friend $2000 to 3 cents that Mr. Depew would be the next republican nominee for the presidency, but nobody offered to take the bet, for Mr. Depew was talking at the time. Those who listen to the the great railroad president somehow get an idea that he can have almost anything he wants, and there is a general impression among Americans here that he wants the nomination for the presidency. In the forcible language of a gentleman who was cuting roast ribs close by him, the presidential bee in his bonnet is rapidly assuming the proportions of a partridge. 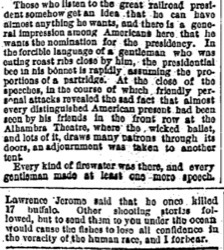 At the close of the speeches, in the course of which friendly personal attacks revealed the sad fact that almost every distinguished American present had been seen by his friends in the front row at the Alhambra Theatre,  where the wicked ballet, and lots of it, draws many patrons through its doors, and adjournment was taken to another tent. Every kind of firewater was there, and every gentleman made at least one more speech. Lawrence Jerome said that he once killed 17 buffalo. Other shooting stories followed, but to send them to you under the ocean would cause the fishes to lose all confidence in the voracity of the human race, and I forbear.